Just like last year, 2016 Futera Unique Arsenal puts a special emphasis on the Gunners with a limited edition set in the same vein as 2016 Futera Unique World Football. Each of the premium packs contain a relic card or other rare insert. Focusing on current stars as well as those from the storied past of the club, the base set is comprised of 50 cards. Select base cards add Silver (#/21) and Gold (#/11) parallels. 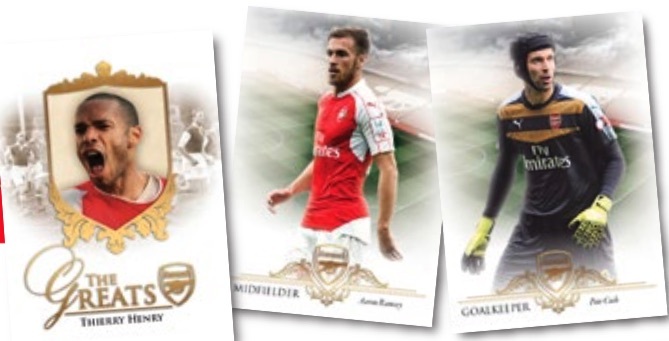 The hits in 2016 Futera Unique Arsenal are heavily centered on relic cards. 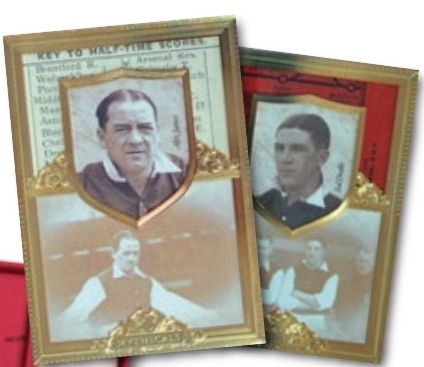 Both the Memorable Dual Memorabilia (16 cards, #/49) and Kitcard Dual/Triple Memorabilia (12 cards, #/35) inserts showcase an Arsenal player with training- or game-used relic pieces. National Heroes Dual Memorabilia cards (5 cards, #/29) take a combo relic approach with two players from the same country. 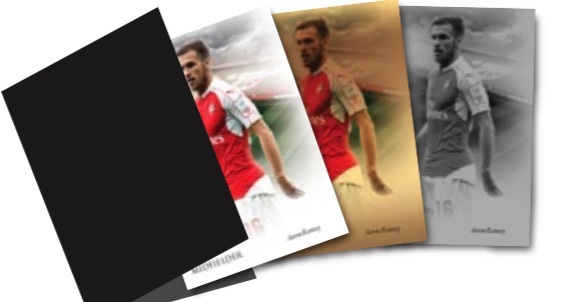 Building on the rarity, The Mythicals (18 cards, #/7) premium inserts are a more ornate offering with a gold-plated frame and memorabilia piece for an Arsenal legend. Even more limited are the Threads Autograph Memorabilia cards. Taking collectors straight to the origins of the release are 1 of 1 Production Sets which feature the original printing plates and proofs used in the making of the cards. Supply is quite limited for 2016 Futera Unique Arsenal, with just 20 cases produced. A similar 2016 set for Manchester City is also available. SUPER RARE FUTERA UNIQUE 2014 RAMSEY MEMO JERSEY MEM21 32 111 ARSENAL LOGO 1 1!! 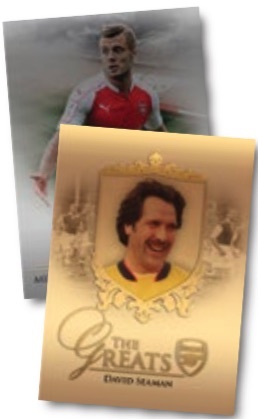 Futera Arsenal The Double. Base set. Futera Arsenal World Class. All 4 cards.